Kennewick, WA- Patrick Holland potentially played his final game as a Tri-City American. 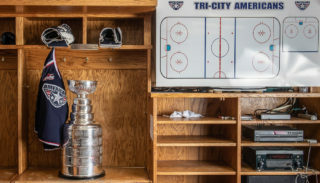 It was a game the team would like to forget, as the Tri-City Americans (0-2-0-0) lost to the Portland Winterhawks (2-1-0-0) 4-2 in front of a 3,174 Sunday night crowd. Nic Petan put Portland ahead in the first period, slapping a shot past Eric Comrie for the lead. Justin Gutierrez received a penalty for slashing at 16:21, and the Winterhawks capitalized on the chance, with Chase De Leo putting home a Troy Rutkowski rebound to increase the lead to two. But the Americans would stay in the game and get one back at the end of the period when Lucas Nickles scored off of a Marcus Messier rebound to make it 2-1. 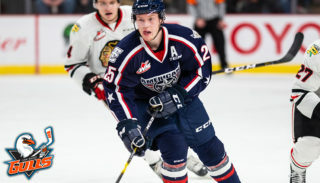 Portland added another power play goal midway through the second period, with the Winterhawks moving the puck around the zone setting up Petan for a wrist shot over Comrie’s right shoulder. Another Winterhawks goal came a few minutes later when a turnover in the Americans end allowed De Leo a one-timer past Comrie, his second goal of the game giving the Winterhawks a 4-1 lead. Tri-City would not go away quietly, with solid passing on the power play, with Justin Feser setting up Mitch Topping for a shot over the right shoulder of Brendan Burke to close the gap to 4-2 after two periods. The third period was quiet, although the Americans kept pressing, with Holland ringing a shot off the post midway through the period. 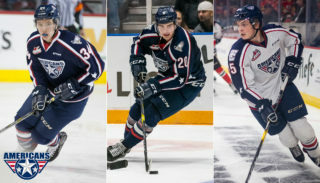 The Americans had some good chances during their 3 power plays in the period, but couldn’t put one in the net as the Winterhawks cruised to the win. Comrie recorded 35 saves in the loss. Holland earned an assist on Topping’s goal. If his career ends tonight, he finishes his Tri-City career with 206 games, recording 63 goals, 146 assists and 209 points. 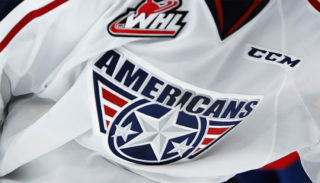 The Americans will be back on the ice on Thursday when they take on the Everett Silvertips (0-1-0-1) at the Toyota Center at 7:05 p.m. The game will be broadcast on NewsTalk 870 and on WHL Live. Tickets are still available for the game at the Toyota Center box office, Fred Meyer outlets, at any Ticketmaster location or online at Ticketmaster.com.